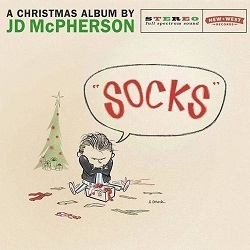 ‘Socks‘ sees JD McPherson return to his rock and roll roots for a Christmas album featuring eleven original songs. It’s an album that captures the novelty aspect of the original rock and roll era, when major artists would think nothing of releasing a cornball track – think Chuck Berry and ‘Run Rudolph run‘, Fats Domino’s ‘Blue Christmas‘ or Little Richard jiving up ‘Santa Claus is coming to town‘ – to cash in on those extra seasonal sales to teenagers hyped up on coke and fries. These days for the most part the Christmas album is a little treat for the fans, unlikely to ever spawn that lucrative perennial Christmas mass-market favourite and artist pension scheme. For all that JD McPherson has approached this album with serious intent – new songs, well recorded and an album he has stated he is proud of. It’s been a well scheduled and planned project, the recording took place in the spring of this year in Nashville and yet it still deliver a powerful whiff of rock and roll tinsel. JD McPherson pings between Christmas love and joy and a balancing slightly jaundiced view of Christmas – ‘Every Single Christmas‘ is a jiving bundle of pleasure, driven along by saxophone and hand claps, and a shot of pure pleasure “Every single Christmas I just fall in love just because I have you here with me“. Contrast that with the pathos of ‘Ugly Sweater Blues‘, which chimes with pity as McPherson begs “Mama don’t make me wear that old thing again / bright red with sleigh bells and a gingerbread man“. ‘Hey Skinny Santa‘ is a grooving swinging rocker which reveals Santa’s diet plan to build up to his full Christmas Eve weight. The title track is a killer slow paced blues about that perfect disappointment of a present, asking “why’d you’d waste the paper on a lousy pair of socks ?” It unarguably makes the case – we might need socks, but nobody wants socks! JD McPherson has said that he thinks the record is so good that “I believe at least a few people will listen to (it) in the summertime“. Well, good as it is, and welcome as a change to the usual well-worn Christmas platters, that really is unlikely. But if you find yourself hankering over some new old rock and roll Christmas songs whilst you cut a rug cradling your eggnog in one hand and clasping your best gal (or guy) with the other then this is your album.